The way you buy your software is changing. Most likely you already know that after January 31, 2016, new perpetual licenses of most individual Autodesk® software will no longer be available for purchase. And, you can continue to use your perpetual licenses going forward, and you’ll stay up-to-date when you keep your Maintenance Subscription active. Or, with Desktop Subscription, you can use the same full versions of Autodesk software, but at a lower upfront cost. But now, customers with eligible licenses of 2005-2015 Autodesk perpetual products qualify to receive rebates of up to $500 on new one, two, or three year Desktop Subscriptions for a limited time. 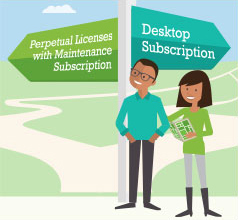 And, new Autodesk 2016 perpetual licenses with Maintenance Subscription purchases are also eligible for rebates of up to $1,250. Don’t wait – rebates end October 23, 2015. Stay up-to-date and save on your software purchases with these special offers. View the terms of this offer. See the flyer. Contact us.